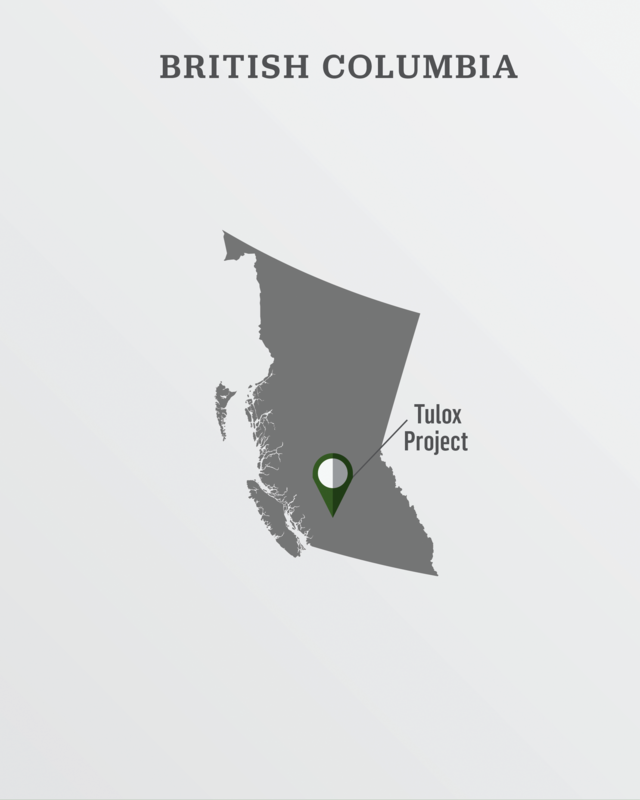 The Tulox property is located in south-central British Columbia in the Clinton Mining Division and consists of of 11 contiguous mineral claims that encompass an area of 5,438.30 hectares. The property is road accessed from the north via 70 Mile House, BC and from the south via Kamloops, BC and Savona, BC. The southern access is from Savona via the Deadman River – Vidette Lake Forest Service Road, a distance of approximately 60 km. From either 70 Mile House or Savona there is excellent access throughout much of the property provided by a multitude of both major and minor logging roads, many of which are subject to active logging operations. As Tulox is a blind deposit, a definitive deposit model cannot be determined due to the lack of outcrop. However elemental signatures and proximity to the intrusive bouncer suggest an intrusion related deposit type. Discovered through systematic stream sediment sampling and tracing high gold concentrations found in silt fraction (0.1-3g/t Au), the Tulox project has had an extensive soil sampling program (1,434 samples) defining two robust anomalies. Neither of these anomalies have been drilled. The Central gold anomaly is defined by a of a cluster of soil samples ranging from 0.1g/t to 0.752 g/t. The soil anomaly occurs any the contact between Upper Triassic medium to course-grained granodiorite pluton and a fine-grained quartz diorite stock. Coincident IP chargeability-resistivity anomalies are centred immediately to the east of and up-slope from the gold soil anomaly. In the south-central part of the grid, also near the granodiorite-diorite contact, a moderate intensity, multi-element silver-lead soil anomaly with a copper-gold-zinc-arsenic association remains open up-slope to the south. This anomaly is underlain by a body of Upper Triassic quartz diorite and appears to lie approximately at the up-ice termination of a dispersion train that was determined from the till sampling results. 2500m of drilling consisting of 3 fences of 3 holes each.